I had a couple of games against Epoc under the Scandinavian Museums' Hnefatafl rules, and the games confirmed that with those rules (11x11 board, king captured from 2 sides, win in corner) the king has not a chance when black doesn't make severe mistakes. Feel free to try out the Scandinavian Museums' Hnefatafl anyway - the results from this version are not included in the ratings. The Skalk 11x11 test tournament is completed. One game timed out after 68 moves but clearly black would've won. These numbers indicate a real heavy unbalance of Skalk 11x11 in favour of the attackers. The five highest rated players out of the nine didn't lose a single game as black, and the sixth and seventh lost only two and one games as blacks. That is, for strong players the balance here is white 0% - black 100%...! The Skalk 11x11 rules made the running in Denmark and possibly in Scandinavia. They were stated in the book "Bræt og brik, Spil i jernalderen", Wormianum 1992 (Board and Piece, Games in the Iron Age), and the same rules are repeated in the later collection of old board games "Den store spillebog", 2000 (The Great Game Book). and states as the source of the rules The Archaeological Museum in Stavanger, Norway. So does the open air museum Land of Legends in Lejre, Denmark. In the 1990'ies the Swedish firm ExpoMedia used the Skalk Hnefatafl for an educational computer game, only reducing the board size to 9x9. The game version with enclosed Skalk Hnefatafl 11x11 rules was sold from museum shops in Denmark from 1992 until recently, and also in rest of Scandinavia. This photo from Roskilde Viking Ship Museum September 2012 shows a mix of two rules sets. The game box is produced by the firm Memory, and the enclosed box rules are the History Craft rules. But beside the box on the grey paper you find the Skalk 11x11 rules. Also, in the exhibition hall where the public can try out the Hnefatafl game, the Skalk 11x11 rules are the rules used. Last edited by Hagbard on Thu Feb 23, 2017 4:15 pm, edited 2 times in total. The two highest rated players out of the eight didn't lose a single game as black, and the third lost only one game as black. So the Skalk 9x9 game balance worsens with player experience. These numbers indicate a severe unbalance in favour of black. The picture shows ExpoMedia's board from the old internet game, drawn by a Swedish artist. On the board the word "hnftafl" is carved in runes. Hello. I am a Scandinavian historian and a have extensive knowledge of the sociology of games. About 4 years ago my colleagues and I did some research and "roll-out analysis's" (you backgammon players know what I mean) on this variation. I am in the process of compiling our research again (as we did it just for a footnote) and, when all found, I will post it to this forum. 1) Due to the beliefs of the Norse people, throughout the time this game was played and found in their literature, the king would have been killed with being attacked on 2 sides not 4. It was the belief, at the time, that the king (or tribal leader) was just the best man for the job and not a deity of some sort (like most kings are supposed to receive divine guidance or something). And the religious structure at the time would have defended this as well. Kings were mere mortals, but had the possibility of something greater AFTER death (to paraphrase). 2) Game-play. Being that the attackers have a numerical advantage, the player who was them would have the upper hand. In the class structure of the Norse people at that time they believed in equality in people of the same class (and even women). With that in mind, we believed that a game of Hnefatafl would have been won or lost on the outcome of 2 games. Each player would take their turn as the attackers and defenders in turn. If each player won a game, the tie would be broken 3 different ways. If you both won with the defenders, the person who won with the least amount of turns win. If you both win with the attackers, it goes by least amount of turns once again. In Norse military culture a swift attack (or escape from danger) would be something of valor. They did champion the "Blitzkrieg" attack of the day. And finally if one person won with defenders and the other with the attackers, the defenders (kings side) would be the winner. This is because the lesser numbered army had won. This also held true in the roll-out. 3) Roll-out. Like I said, I do not have the exact numbers as of yet but this is the basics of it. By playing the 2 game "rubbers", it gave the game a kind of duplicate bridge type of numbers. The 68% average score of players it was almost even for wins and losses. But there were outlyers of the people who were just poor at the game, or were either great (or played near perfect strategy). But after looking at the numbers, we deduced that the rubber matches evened the playing field to the point that neither side (defender or attacker) had a significant advantage. Thus this changed the game to a game of who has the better overall decisive strategy, than one of just simply who won or lost a certain game (due to the offset of the respected pieces). I hope this information is helpful for everyone. But you can see the philosophy of the game here. It is about who is better overall and who is more decisive in "battle". This were virtues of the Norse people of that time, and it makes sense for the game. Rynoknight wrote: 1) Due to the beliefs of the Norse people, throughout the time this game was played and found in their literature, the king would have been killed with being attacked on 2 sides not 4. Thanks Rynoknight, some interesting suggestions. Most of my thoughts about what you say are well covered by Crust's perceptive questions about the strategies that logically result from paired games where the winner is he who wins in the fewest moves. I'd be very interested to hear what you think about that, as your reply to Crust didn't mention it. In response to your suggestion about having two side king capture in accordance with Norse belief systems, I'd like to put forward an idea I came upon while working with archeologists and viking historians in Vestfold Norway. As you say, "Kings were mere mortals, but had the possibility of something greater AFTER death", this is perhaps the viking concept of 'ettermæle', ones 'legacy' in the form of stories told about your actions down through the ages. In short, how one is remembered. And death in battle was it seems something of a goal in life. According to the viking experts I work with, a viking king or chieftain would rather die than turn tail and flee from a battle field. They say the idea of running away, of ditching your fellow warriors and beating a hasty retreat, was simply not an option for a viking. Vikings expected songs to be sung about their deeds through the ages, and I doubt they would have enjoyed the Monty Python song 'brave sir robin' being dedicated to them: 'when danger reared its ugly head, he bravely turned his tail and fled'. So it occurrs to me; that chap in the middle of the hnefatafl board, he is not a viking king. He is some other king or figurehead being attacked by vikings. Or if he does represent a viking king, he represents a coward, a turncoat, not worthy of the viking name. His singular goal in the game, by any understanding of hnefatafl, is to bravely run away. Now, this conclusion is taken directly from an understanding of viking culture. And if one can agree to it being logically consistent, then one can quite reasonably arm that king to the teeth without being in conflict with our understanding of viking culture. And after all, if its equality you want, then the attackers, with no designated king, are your equal vikings, not the defender with a designated king. That said, I for one would be happy to take part in a tournament set up on Aages site according to your rules and suggestions, where moves are counted and games one according to decisive strategy. If such a tournament happens I hope you will join in the fray! 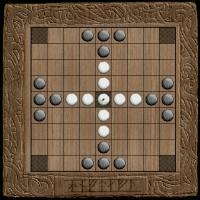 Skalk Hnefatafl 11x11, rule of surrounding. The attackers win by taking the king. This is achieved in the usual way by sandwiching between opposing pieces or against a corner-square, but if His Majesty is standing upon his centre-square it is necessary to sandwich him in on all four sides with four opposing pieces. If he is standing on one of the squares to one side of the centre-square the same applies, though here only three opposing pieces are required, the fourth being replaced by the "forbidden" centre-square. The attackers have also won if the situation arises that all the defender's pieces have been rendered immobile by encirclement. So Skalk Hnefatafl already in 1992 had a surrounding rule like the one we introduced to Copenhagen Hnefatafl. Thus the "Monstrosity Fort" problem was already taken care of both by David Brown and in Skalk Hnefatafl. April-May 2017 we had another go at testing Skalk Hnefatafl 11x11. The game balance measured from this test tournament alone was -4.00 (30 games). March 2013 we had a first test tournament of Skalk 11x11, resulting in a measured game balance of -3.97 (72 games). Calculated from all Skalk 11x11 games played since Dec. 2010, the game balance is worse than -3.77 (172 games) (more than 38 attackers' wins per 10 defenders' wins). These figures are consistent with our experience with Skalk 11x11 ever since the start of online human-against-human games on this site Feb. 2010. At first, Skalk 11x11 was the only tafl game available here for human-human games, but soon it became clear that it was extraordinarily difficult to win as white. After this, other tafl variants were introduced and tested here. The many Skalk games from this first time Feb.-Dec. 2010 were unfortunately not recorded for statistics. Skalk 11x11 was until Sep. 2012 the tafl game of Scandinavian Museums, and it's still the tafl game of Danish historical board game books. To this day, university board game historians presume that Skalk 11x11 works; however, all testing done on this site has shown that it does not. The Skalk 11x11 was an archaeologist's educated aim 1992 at the historical hnefatafl rules, and although it misses the mark and doesn't work, it's not too far from it. Reduce the board size to 9x9 and have the king win on edge instead of corner, and you have the Saami Tablut 9x9 which indeed works, and which this community found to be the probable, real historical hnefatafl (9x9 version).